Hey Cubs fans, I have one piece of advice at this point of the season. Let's stop and take a deep breath here. Really stop and think about what it is that you're seeing. I mean really sit back and look at what the Cubs have done to this point. Things are getting historic, and they're getting there pretty quickly. This is the best Cubs start in over a hundred years by just about any measurement - record, run differential, defensive ability, walks, runs scored, zany suits worn. I know I wasn't alive for a lot of them, but this really looks like the best Cubs team of many people's lifetimes through the first month of the season. It's the first week of May and the Cubs have not lost two games in a row yet. They have three starting pitchers with ERAs under 1.90. And we've taken 2 of 3 on the road against what looks like one of the top 3 teams in the NL. This is going to be a season to remember, so take as many chances as you can to sit back and really appreciate how good this team is. 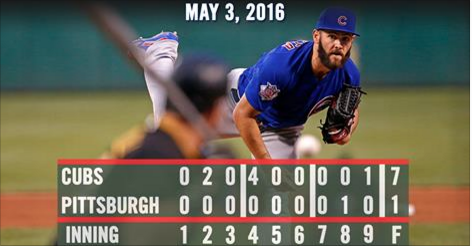 What Happened: It was Jake Arrieta against the Pirates in Pittsburgh, so you know what happened. When the Cubs scratched 2 runs across in the top of the 3rd, everyone in the stadium knew that the game was most likely over, and it was. Game MVP: Obviously Jake Arrieta. The greatest measurement of how dominant he is right now? The look of the Pirates batters from the 3rd inning on. They had the worst body language in the world. It was the kind of body language that you have when you have to come in to work on the 4th of July - you don't see what the point is and it shows. They knew the game was over. Game LVP: Another reason the game seemed to be over in the 3rd inning was because there was no one in the stands. You'd think a matchup between the top two teams in the NL Central with the reigning Cy Young winner would attract more than 300 people, but you would be wrong. I don't know what else the people of Pittsburgh need to show up to Pirates games. Maybe 'Bring A Random Homeless Guy From Outside To The Game' night? Or maybe just show old Penguins and Steelers highlights the whole time on the Jumbotron? Gist Stat (or GISTAT): Over their last 90 regular season games, the Cubs are rocking a .720 winning percentage. That's a 117 win pace over a 162 game season. The record for most wins in a season is 116. That's not to say that the Cubs will set a new all-time wins record...but things are going good. Game three against the Pirates kicks off at 11:35 AM CST. The Cubs go for the backbreaking sweep behind Jon Lester, who faces off against starting pitcher and human gasoline fire Juan Nicasio.